Lindsay Scott was born in Bulawayo, Zimbabwe, and grew up among the green hills of Africa. As a child, she was constantly exposed to African wildlife and its habitat. She has been drawing for as long as she can remember. As a child, she practiced every day by trying to emulate the delicate drawings of Leonardo da Vinci. By the time she reached high school, an influential teacher recognized her talent and helped in its development. While still in high school, she had already begun to explore Africa’s natural treasures, developing an interest in biology, and trying to decide what career path to follow. At the University of Cape Town, South Africa, she attended the Michaelis School of Fine Art. After two years she transferred to the University of Minnesota and received her degree in Fine Arts. When Scott returned to South Africa, she went to work at the Cape Town Natural History Museum and spent the next three years cataloging and dissecting birds. While a transition to another medium isn’t easy, Scott’s command of oils is astonishing. Her training and mastery of drawing have helped, but her knowledge of animals, their habitat, and the light and mood of Africa have brought it all together. 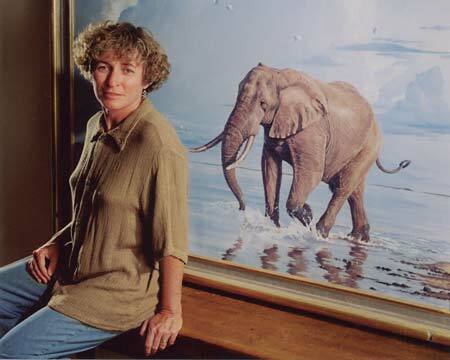 She is now considered to be one of the preeminent wildlife artists in the world. Lindsay B. Scott’s documentation took place in 1997 and 2001. The FOTM Archive contains extensive information about this artist.